But some insurance companies are reaping spectacular profits off the taxpayer-funded program in California, even when the state finds their patient care is subpar. A unit of Centene Corp., the largest Medicaid insurer nationwide, raked in $1.1 billion in profits from 2014 to 2016, according to state data obtained and analyzed by Kaiser Health News. Anthem, another industry giant, turned a profit of $549 million from California’s Medicaid program in the same period. 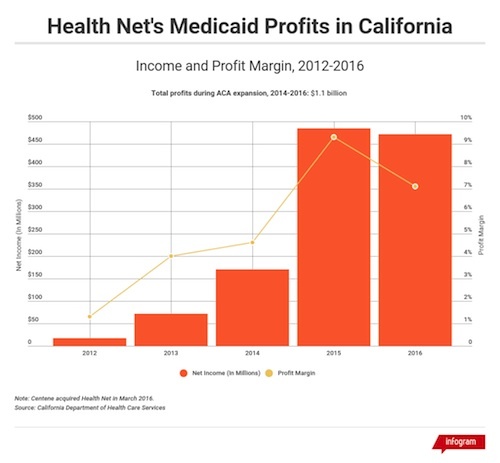 Overall, Medicaid insurers in the Golden State made $5.4 billion in profits from 2014 to 2016, in part because the state paid higher rates during the inaugural years of the nation’s Medicaid expansion under the Affordable Care Act. Last year, they made more money than all Medicaid insurers combined in 34 other states with managed care plans. “Those profits are gigantic — wow,” said Glenn Melnick, a health economist and professor at the University of Southern California. Jennifer Kent, California’s Medicaid director, said that health plan profits were higher than anticipated during the ACA expansion. But she said the state expects to recoup a significant amount of money within the next year, once audits are complete and retroactive rate adjustments are made. Health insurers who profited substantially from Medicaid, known as Medi-Cal in California, defend their good fortune. They say these surpluses follow losses in earlier years, and they always run the risk of red ink if medical costs jump. More than 1 in 3 Californians, or 13.5 million people, are covered by Medicaid — more than the entire population of Pennsylvania. About 80 percent of those in California’s program are enrolled in a managed-care plan, in which insurers receive a fixed rate per person to handle their medical care. The goal is to control costs and better coordinate care. In anticipation of the Obamacare rollout, officials in California and elsewhere boosted their payments to managed-care companies because they expected Medicaid costs to increase as newly insured patients rushed to the doctor or emergency room after going years without coverage. But those sharply higher costs didn’t materialize — and insurers pocketed more money as a result. Before the ACA expansion, California’s Medicaid plans collectively were barely in the black, with $226 million of net income for 2012 and 2013 combined. Traditionally, these insurance contracts have yielded slim profit margins of 2 percent to 3 percent. California said it aims for 2 percent when setting rates, based on prior claims experience and projected costs. Centene’s Health Net unit in California enjoyed a profit margin of 7.2 percent from 2014 to 2016. Centene acquired Health Net for $6.3 billion in March 2016. 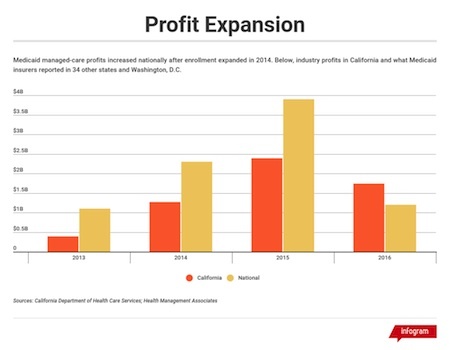 Anthem’s profit margin in California’s Medicaid program was 8.1 percent for 2014 to 2016. Investors have cheered those results. Shares in Anthem have more than doubled since January 2014, when the Medicaid expansion began. Centene shares are up 50 percent since the company purchased Health Net last year. In a statement, Health Net said its profit margins are comparable to other Medi-Cal health plans and the company has made major investments to improve Californians’ health and access to care. Charles Bacchi, chief executive of the California Association of Health Plans, said they deserve some credit for making the Medicaid expansion work. Overall, Centene has 7 million Medicaid enrollees across the country, with about 2 million in California. Anthem is close behind with 6.4 million Medicaid members, about 1.3 million in the state. A nationwide study published in September found that average monthly spending on newly eligible Medicaid enrollees was 21 percent less than the amount spent on those who were already eligible. It helped that many of the new enrollees appeared to use fewer medical services than those already on the program, researchers said. By 2016, profits dropped as some states reduced Medicaid rates to insurers to reflect the lower costs incurred during expansion. Kent, the California Medicaid director, said the state’s rates paid to insurers for enrollees in the expanded program have decreased by 38.5 percent since January 2014. The federal government footed the entire bill for Medicaid expansion during the first three years, instead of taking the usual approach of splitting the costs with states. Now, states have more incentive to rein in spending, as their share of the costs grows to 10 percent by 2020. The state scores Medi-Cal insurers from zero to 100 percent on how they perform on dozens of measures, such as diabetes testing, cancer screenings and checkups for children. Statewide, the average score was 63 percent for 2016. 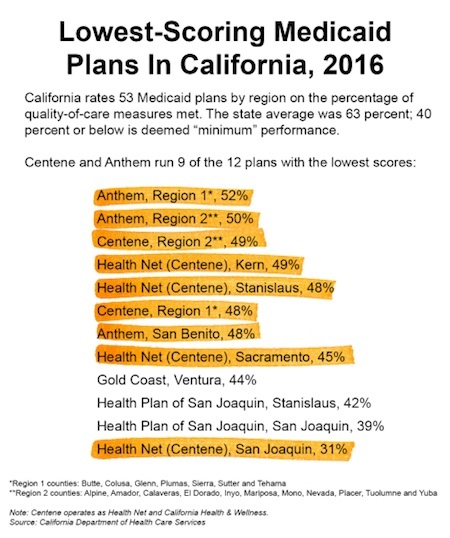 For Centene and its Health Net unit, seven of its 10 regional health plans in Medi-Cal scored below average on quality. The company’s San Joaquin health plan ranked last statewide at 31 percent. State officials have ordered the company to improve in areas such as ensuring women get postpartum care and providing routine eye exams and other tests for diabetics. Chandra Marshall, a Medicaid patient in Modesto, Calif., said she has suffered from limited access to specialty care. Her Health Net plan in Stanislaus County scored below 50 percent on quality care measures. In a written response to questions, Anthem said its scores have improved over time and two of its plans, in San Francisco and Tulare counties, are among the top 10 statewide. The profits of managed care plans feed into Republican criticism of the ACA’s costs and its expanded Medicaid rolls. President Donald Trump has called for the law’s repeal, in part, because it enriches health insurers. “They have made a fortune,” Trump tweeted on Oct. 13. Sen. Ron Johnson (R-Wis.) has demanded that California and seven other states account for how they spent federal Medicaid expansion dollars. Johnson, chairman of the Senate Homeland Security and Governmental Affairs Committee, asked California officials in a letter Sept. 27 whether they have conducted audits and requested information on insurance company payouts. Starting in 2014, the federal government required that 85 percent of Medicaid expansion funding be spent on care and quality improvement efforts, rather than administrative overhead and profits. But three years in, California officials acknowledged they have just started audits to determine whether companies might have to return excess money. What’s clear is that insurers’ spending on both expansion and traditional Medicaid enrollees often falls short. Eight of California’s 22 Medicaid insurers failed to hit 85 percent in medical spending for the year ending June 30, 2016, according to state data obtained by Kaiser Health News. Anthem ranked lowest at 77 percent; Health Net spent 81 percent of Medicaid premiums on medical care, state records show. Each percentage point below the threshold can amount to tens of millions of dollars that should have been spent on behalf of patients. In July, a federal rule went into effect establishing 85 percent as a national benchmark for all Medicaid managed care. Three months later, California Gov. Jerry Brown signed a law mandating that same percentage. But the state requirement doesn’t kick in fully until 2023. Michael McCue, a professor at Virginia Commonwealth University who studies Medicaid managed care, said the profit margins in California “raise a lot of red flags.” He said government officials owe it to taxpayers and patients to do more to hold insurers accountable. Los latinos, que hace apenas un año eran los consumidores más buscados para inscribirse y obtener cobertura a través del mercado de seguros de la Ley de Cuidado de Salud Asequible (ACA), puede que este año sean los grandes ausentes. Navegadores y activistas comunitarios temen que el enfoque de la administración Trump —dejar que el Obamacare se vaya muriendo, quitar fondos y reducir el tiempo del período abierto de inscripción— puede revertir los logros alcanzados en el número de latinos con cobertura de salud. Los latinos fueron el blanco de los esfuerzos de la administración Obama, porque la comunidad tiene una alta tasa de no asegurados, y también porque una larga proporción de la comunidad es joven y bastante saludable, un detalle muy apreciado por las aseguradoras para balancear el gasto que generan los pacientes mayores y más enfermos, de hecho los que se inscriben con más facilidad. Cerca de un millón de personas que se identificaron como latinas o hispanas se inscribieron para tener planes de salud a través del mercado de seguros este año, componiendo una décima parte de los consumidores. La tasa de personas sin seguro entre los latinos bajó de 43% en 2010 a menos del 25% en 2016. Pero todavía millones son elegibles y permanecen sin seguro. Un período de inscripción más corto y recortes en los fondos federales para publicidad y para los grupos de navegadores —expertos en el mercado de seguros que ayudan a registrarse—, potencialmente pueden reducir de manera drástica la inscripción de latinos. California es uno de alrededor de una docena de estados que gerencian su propio mercado de seguros, y el estado utiliza su propio dinero para publicitar Covered California. El mercado ofrecerá a los consumidores un período más largo de inscripción que la ventana de seis semanas del gobierno federal: durará hasta 31 de enero, igual que el año pasado. Los latinos en el estado han ganado cobertura desde la implementación de la ley federal de salud. El número de personas sin seguro cayó de 23% en 2013 a 12% en 2015, según la California Health Care Foundation. (La fundación publica California Healthline, un sitio de noticias editorialmente independiente producido por Kaiser Health News). Aun así, los esfuerzos de inscripción en el estado presentarán un desafío si los consumidores no entienden qué está pasando con la ley, mientras en Washington persisten los esfuerzos por reemplazarla, dijo Edgar Aguilar, director de programas en Community Health Initiative, un red de organizaciones de base en California que asiste a las personas con la inscripción para obtener seguro. Aguilar está a cargo de la operación en el condado de Kern, en el Valle Central, en donde hay una gran población de latinos que trabajan en granjas y cultivos. “Tuvimos éxito inscribiendo a latinos en el pasado, el porcentaje de latinos sin seguro en el condado es de menos del 8%; pero la confusión sobre lo que está pasando con el Obamacare y el miedo a tener problemas migratorios, hace que las personas lo piensen dos veces antes de renovar un plan de salud o inscribir a sus hijos en el Medicaid o en CHIP”, explicó. En los 39 estados que usan el sitio web federal la inscripción empieza el 1 de noviembre y termina el 15 de diciembre, cerca de un mes y medio menos más corta que el período anterior. Algunos estados que gerencian sus propios mercados de seguros han extendido la inscripción hasta el 31 de enero. Claudia Maldonado, directora de programas de Keogh Health Connection, una organización que conecta a personas vulnerables con servicios de salud en Phoenix, Arizona, dijo que la incertidumbre domina estos días. “Estamos listos, porque sabemos que va a ser un período abierto de inscripción difícil”. Oficiales federales dijeron que el sitio web para inscribirse en español, cuidadodesalud.gov, va a estar operando de nuevo esta vez, pero sufrirá los mismos cierres por mantenimiento programados para su hermano anglo, healthcare.gov. Los Centros para Servicios del Medicare y Medicaid (CMS, por sus siglas en inglés), que gerencia los mercados de seguros federales online, anunció el mes pasado que los sitios estarían “cerrados por mantenimiento” la mitad del día los domingos, durante el período abierto de inscripción. Los estados que manejan sus propios mercados, como California y Nueva York, no se verán afectados por estos cierres programados. Es desafortunado que la interrupción del servicio de cuidadodesalud.gov sea los domingos, dijo Daniel Bouton, director de servicios de salud en el Community Council of Greater Dallas, en Texas, una organización sin fines de lucro que ayuda a los latinos a inscribirse para tener atención de salud. “El día que los hispanos van a la iglesia, en donde están todos juntos y en donde los ayudamos a inscribirse en períodos anteriores”, agregó. “Las personas quieren tener resuelto el tema de su cobertura de salud”, expresó Anne Packham, directora del proyecto de mercados de seguros en Covering Central Florida, una organización con sede en Orlando, Florida. “Y todos los anuncios sobre el Obamacare los frustra”. Inscribir a un consumidor en el mercado no es un proceso de 10 minutos. Una familia puede comprar un plan de salud en el sitio web, o averiguar si algunos de los miembros son elegibles para el Medicaid o para CHIP, el programa federal de salud infantil con base en los estados para familias de bajos ingresos, pero que ganan demasiado como para calificar para el Medicaid. La sesión con un navegador, que han ayudado a millones de latinos a inscribirse en todo el país, puede llevar una hora y media o más. Muchos hispanos prefieren inscribirse para cobertura en persona, con un navegador entrenado, dijeron muchas personas con experiencia en ayuda a consumidores. En un correo electrónico, los CMS dijeron que los cierres de los sitios web no afectarán el flujo de inscripción y que el centro de llamadas federal para responder preguntas de consumidores y navegadores “continuará asistiendo a las personas”. “Es importante destacar que la duración potencial de los cortes es el máximo tiempo permitido para mantenimiento; pero podrían ser más cortos”, agregaron en el correo. El sitio web en español tuvo un comienzo accidentado cuando se lanzó el Obamacare en 2013: abrió dos meses después que la versión en inglés. Sin embargo, los navegadores dicen que cuidadodesalud.gov a menudo ha servido como el “último recurso” para todos los consumidores, latinos o no, cuando tenían problemas con el sitio en inglés. “En períodos de inscripción anteriores, muchas veces cuando healthcare.gov estaba caído, el sitio en español no lo estaba”, dijo Bouton. “Los navegadores son bilingües y generalmente usan el sitio en inglés, pero cuando éste no está funcionando bien, terminan el proceso de inscripción en cuidadodesalud.gov, que generalmente funcionó mejor [que healthcare.gov] en años anteriores”, dijo Julia Holloway, directora de desarrollo de programas y servicios de navegadores para Affiliated Service Providers of Indiana, en Indianapolis. Oficiales federales le anunciaron que su programa tendría 82% menos dinero para navegadores durante este período de inscripción. El menor flujo de consumidores en cuidadodesalud.gov ha hecho que la versión en español sea tecnológicamente más estable que la versión en inglés. Como ejemplo, desde noviembre de 2015 hasta el 2 de enero de 2016, cerca de 20 millones de personas usaron healthcare.gov, comparado con 953,708 que navegaron cuidadodesalud.gov. Edgar Aguilar, gerente de programas en Community Health Initiative, una red de organizaciones de base en California que asiste con el proceso de inscripción para tener cobertura, dijo que, aunque California no enfrente algunos de los obstáculos que tendrán los estados que usan el mercado de seguros federal, la inscripción este año va a ser un desafío. Aguilar está a cargo de la operación en el condado de Kern, en el Valle Central, que cuenta con una alta población de latinos que trabajan en granjas y cultivos. Navegadores encuestados para esta historia dijeron que han sentido más tensión este año, en los días previos a que comience el período de abierto de inscripción. En agosto, miembros hispanos del Congreso enviaron una carta al Departamento de Salud y Servicios Sociales (HHS, por sus siglas en inglés) pidiendo un reaseguro para que los latinos siguieran inscribiéndose. Una vocera del caucus dijo que un representante del HHS prometió organizar una reunión sobre el tema, pero ésta nunca se concretó. Un obstáculo para la inscripción es el miedo a las deportaciones. Los inmigrantes indocumentados no tienen derecho a comprar un seguro de salud a través de los mercados de ACA, pero hay miles de familias con estatus migratorio mixto, y los defensores temen que puedan dudar en comprar un seguro o solicitar subsidios para ayudar a pagar la cobertura. “Desde que asumió el nuevo gobierno, cuando aumentaron las redadas y se puso en peligro el estatus de los ‘Dreamers‘ (jóvenes que fueron traídos al país cuando eran niños), las personas comenzaron a cancelar sus citas con los navegadores, y dejaron de inscribir a sus niños en el Medicaid o en CHIP”, dijo Bouton. Sin embargo, los navegadores dijeron que no se dan por vencidos. “Seguimos haciendo llamadas. Tenemos la misma meta de inscribir a más personas”, dijo Maldonado. Su organización está operando con 30% menos de presupuesto para navegadores. En su estado, Cover Arizona, una red de entidades sin fines de lucro, continúa organizando eventos, repartiendo folletos y llamando a las personas para alentarlos a que se inscriban. “Tuvimos que cortar el presupuesto para publicidad, pero otra organización que tiene presupuesto nos ayuda repartiendo nuestros materiales”, dijo Bouton. Más que nunca, dicen los navegadores, el foco está puesto en el trabajo en equipo. “Somos apasionados en lo que hacemos, y vamos a tratar de inscribir a la mayor cantidad de gente posible”, concluyó Holloway. Esta historia de California Healthline fue producida por Kaiser Health News, un programa editorialmente independiente de la Kaiser Family Foundation. Most everyone agrees it can be very difficult — next to impossible, really — for Medi-Cal enrollees to snag a spot in a nursing home, especially if they’re transferring from their homes or assisted living facilities rather than going straight from the hospital. Not everyone agrees on the reasons, however. “There’s massive, systemic Medi-Cal discrimination,” says Pat McGinnis, executive director of California Advocates for Nursing Home Reform. She believes some nursing homes illegally turn away enrollees because they don’t want to accept Medi-Cal’s lower reimbursement rates. “If they can get more money with private pay or Medicare, they would rather accept one of them,” she says. Deborah Pacyna, director of public affairs for the California Association of Health Facilities, which represents most of the state’s standalone nursing homes, says it’s illegal for nursing homes to discriminate based on payment type. She blames access problems on the state’s rapidly aging population. If you think low-income doesn’t mean you, think again. Many middle-class Californians need Medi-Cal to help pay for their long-term care because they run out of money paying the bills on their own, she says. Despite the access challenges many Medi-Cal enrollees face, about two-thirds of California’s nursing home residents rely on the program to cover all or part of their costs. Today, I’m offering some advice if you or a loved one needs a nursing home for a long-term stay. It will be easier if you’re already in the hospital, which I realize is cold comfort. Finding a bed if you’re not in the hospital — especially a bed in your community — might mean you’ll have to pay out of your own pocket initially. Or it might require some creative maneuvering, like working with your doctor to get you admitted to a hospital. Even then, “a hope and a prayer” might be necessary, says Derrell Kelch, executive director of the California Association of Area Agencies on Aging. 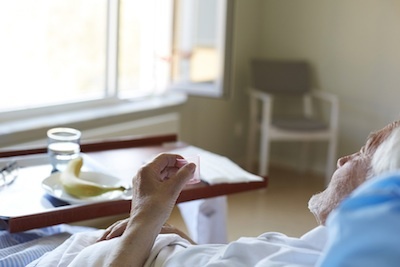 More than 90 percent of nursing home admissions last year came directly from hospitals, according to data from the Office of Statewide Health Planning and Development. If you or a loved one is in the hospital and may not be able to return home afterward, “start working with the hospital discharge planner immediately” and ask for a list of nearby nursing homes, Kelch advises. If you have fee-for-service Medi-Cal, you will require prior authorization, and the request must be made by the hospital or the nursing home, says DHCS spokeswoman Carol Sloan. If you’re in a Medi-Cal managed care plan, it will help determine where you go, she says. You may want to visit the facility first before committing your loved one to it, Pacyna suggests. Also check out Nursing Home Compare on the Medicare website for quality ratings. Medicare, the publicly funded health insurance program for older Americans, is often the first payer when you move into a nursing home. Under certain conditions, it will cover you for a limited time — up to 100 days. The traditional form of Medicare will pay 100 percent for the first 20 days, after which you will owe $164.50 a day for up to 80 additional days. But you can qualify for this coverage only if you enter a Medicare-approved nursing facility within 30 days of an inpatient hospital stay that lasted at least three days. Beware: “Observation” care in the hospital won’t count as an inpatient stay. Medicare does not cover long-term nursing home stays. So, once you are in the nursing home, don’t wait to apply for Medi-Cal if you’re not already enrolled in it, Geffen says. Medi-Cal can help cover your Medicare copays, if you’re eligible, and then take over when your Medicare coverage ends, she says. “They can’t just discharge somebody [from a nursing home] because they’re going on Medi-Cal,” McGinnis says. If the nursing home balks and says it can’t keep you after you’ve switched to Medi-Cal, you can seek help from McGinnis’ organization (www.canhr.org or 800-474-1116) or another advocacy group, including legal services organizations or your local Long-Term Care Ombudsman, she says. Be sure to let the facility know that you know it can’t discriminate against Medi-Cal enrollees, McGinnis adds. Just because a small percentage of patients admitted to nursing homes last year came from their homes or assisted living facilities doesn’t mean people aren’t trying, says Mike Connors, an advocate for McGinnis’ group. To find a facility that is certified for Medi-Cal, go to the state Department of Public Health’s database at hfcis.cdph.ca.gov. You might need to target larger nursing homes that have higher turnover, McGinnis says. If it’s financially possible, consider starting out as a private-pay client. Instead of getting rid of all of your money ahead of time to become eligible for Medi-Cal long-term care coverage, Geffen suggests keeping some in reserve so you can gain entry as a cash customer. Then, once you’re a resident and run out of money, “they’re not allowed to kick you out,” Kelch says. Geffen also knows of people who have gone to the hospital in the hope of getting admitted, so they can be discharged directly into a nursing home. “Some people have had to go to extraordinary feats in order to get into a nursing home on Medi-Cal,” she says. You can also consult with your doctor to devise a plan. If she agrees that you need to be in a facility, request documentation that you can take to the nursing home as proof, Pacyna says. Or, “if you’re ill, it may be appropriate to be admitted to the hospital,” Connors says. I wish there were more support for individuals and families struggling through this. Placement services, such as A Place for Mom, can help you find a nursing home with openings. You can also talk to an elder law attorney. You can even ask your county social services department for help, says Benson Nadell, director of the San Francisco Long-Term Care Ombudsman program. “People cannot navigate this complex system on their own,” he says. The Board of Supervisors voted Tuesday to create a “bill of rights” for foster youth that lays out rights, resources and services available to kids and their foster parents. California has its own such bill, but county officials said it’s outdated and doesn’t include county programs. Supervisor Janice Hahn championed the move. Examples include a policy that allows social workers to act in lieu of a parent to help a foster child get a driver’s license and the fact that foster youth have access to MediCal until age 26. Six current and former foster youth will join the bill of rights working group. Hahn had originally proposed two representatives but upped the total based on feedback at the board meeting. The group, to be led by the Department of Children and Family Services, is also expected to include county lawyers, mental health workers, probation officers, health care professionals and representatives of various community- based organizations. Advocates said that concerns about navigating the foster care system deter some potential foster parents at a time when the need is great. Others noted the complexities of the foster care system. In Nichols-Julien’s case, understanding the laws helped a girl she was mentoring avoid moving into a group home while she was working to reunite with her family. A state effort to reform foster care requires that foster youth have access to specialized mental health treatment, transitional support as they move from foster to permanent home placement, connections with siblings and extended family members and transportation to school. Roughly 35,000 children and young adults receive child welfare services from the Department of Children and Family Services. A little less than half live outside their homes in a foster care or group home. A report back is expected in 120 days. Civil rights advocates sued California last week, alleging that care provided by Medi-Cal, the state’s health program for low-income people, is substandard and disproportionately hurts Latinos — by far the largest group of enrollees. 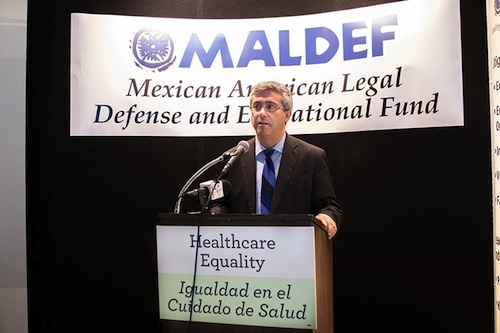 The lawsuit, filed in Alameda County Superior Court by the Mexican American Legal Defense and Educational Fund (MALDEF) and the Civil Rights Education and Enforcement Center, says Medi-Cal participants have “substantially worse access to health care than their counterparts” in employer-based insurance plans or Medicare, the federal program for seniors and people with disabilities. State and federal laws require Medi-Cal to provide a level of care that is on par with that available to the general population, according to the court filing. The two groups that filed the case hope to get it certified as a class-action lawsuit on behalf of all Medi-Cal enrollees. The complaint claims that beneficiaries of Medi-Cal, the state’s version of the Medicaid program, often experience delays in care or are denied care altogether. And, it says, they may have to travel longer distances to find medical providers who are willing to see them. The department said it “routinely monitors access and network adequacy in the contracting Medi-Cal Managed Care Plans.” The lawsuit blames the alleged obstacles to health care access on low reimbursement rates, which it says discourages doctors from accepting Medi-Cal patients. The suit also says the state has failed to provide adequate monitoring to ensure that beneficiaries have timely access to care. The plaintiffs do not request specific monetary damages, other than attorney fees and other legal costs. Rather, they seek systemic changes, including “adequate” pay for doctors treating Medi-Cal beneficiaries and better monitoring and enforcement to ensure patients get care when they need it. The suit follows a federal administrative complaint filed by the same groups in December 2015 with the U.S. Department of Health and Human Services. That case did not lead to an investigation, MALDEF said. The new lawsuit is a different approach to address the same problem, said Thomas Saenz, the group’s president and chief lawyer. In a May 2016 letter responding to the federal complaint, California’ s Office of the Attorney General noted that current law “provides a number of remedies that provide relief if a Medi-Cal patient is denied timely access to needed care and services.” For example, they can submit a complaint to their health plan that must be resolved within 30 days, the letter said. The attorney general’s office also said it had no evidence to show Latinos were treated differently than other Medi-Cal beneficiaries. As of January 2017, 48 percent of California’s 13.5 million Medi-Cal beneficiaries were Latino, according to data from the Department of Health Care Services. 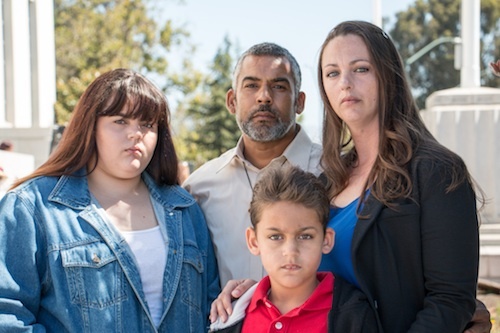 The lawsuit names five individual plaintiffs, including a Sacramento couple — Rebecca Binsfeld, 35, and her husband, Carlos de Jesus, 43 — who said they have experienced delays in care. Binsfeld suffers from lupus and de Jesus has chronic back pain. They also have a 16-year-old daughter with scoliosis. The family used to get primary care at UC Davis Medical Center, until their Medi-Cal managed care plan under Health Net terminated its contract with the hospital in 2015. They sought primary care elsewhere but had difficulty finding a doctor willing to take new Medi-Cal patients, Binsfeld said. She eventually found help at a local community clinic in Sacramento, but it took 10 months for her to be seen by a rheumatologist — more than double the recommended time between such visits. And she experienced debilitating symptoms while she waited, she said. Darin Ranahan, Binsfeld’s attorney, said the point of the lawsuit is “for the state to stop discriminating against people with Medi-Cal” and make sure that access to care is the same as for people with other types of insurance. “That means the state will need to allocate money for reimbursement rates and also remove barriers to care,” he said. But state legislators, the medical industry and Gov. Jerry Brown wrangled over Medi-Cal rates earlier this year — and not to the entire satisfaction of doctors or patient advocates. Last month, Brown approved a state budget that sets aside $465 million of tobacco tax money to boost Medi-Cal payments for doctors and dentists. That’s about one-third of the $1.2 billion the tax is expected to raise in its first year. Health care advocates and doctors had initially hoped that entire amount would be used to raise providers’ pay, and during the debate over the budget they argued that voters had approved the tax last November with the same idea in mind. Saenz said that while boosting Medi-Cal provider rates is an essential part of improving access to care for Medi-Cal patients, it is not the entire solution. There are also systemic and administrative hurdles to overcome, he said. They include long application processing times and the challenge of ensuring that physicians and specialists have the capacity to see new patients, he said. There is also a big question mark hanging over the whole Medi-Cal program, given efforts in Congress to cut Medicaid funding and roll back the program’s expansion under Obamacare. Saenz said that it is difficult at this point to assess how such changes would affect California’s ability to improve access and quality of care for its Medi-Cal population. Políticos, proveedores de atención médica y defensores de los consumidores en California tuvieron ásperas críticas para el flamante proyecto de ley de salud del Senado revelado el jueves 22 de junio, argumentando que podría hacer que la cobertura sea inaccesible para los residentes más pobres, a la vez que recortaría impuestos para los ricos. “Este proyecto no es un proyecto de atención de salud, dijo Ed Hernandez, demócrata y presidente del comité de salud del Senado estatal. “Este es un proyecto de ley de impuestos que beneficiaría a los individuos más ricos a expensas de aquellos que más necesitan atención de salud: los trabajadores pobres y los adultos mayores”. El gobernador demócrata Jerry Brown dijo en un mensaje en Twitter que el proyecto de ley tenía el mismo “olor fétido” del proyecto de ley aprobado por la Cámara Baja el mes pasado. “Millones perderán cobertura de atención médica, mientras que los millonarios ganarán”. “El pueblo estadounidense merece algo mejor”. El proyecto de ley de 142 páginas, revelado el jueves por la mañana, reemplazaría a la Ley de Cuidado de Salud Asequible (ACA) y rechazaría los impuestos establecidos para pagar por muchos de los beneficios de la ley. La legislación propuesta también reduciría de manera significativa los fondos para el Medicaid, el programa para las personas de bajos ingresos, y eliminaría gradualmente la expansión masiva del programa, que se inició con ACA. También limitaría la elegibilidad para obtener subsidios en forma de créditos impositivos para comprar seguro de salud en los mercados federal y estatales, y permitiría a las aseguradoras cobrar a los adultos mayores hasta cinco veces más que a los consumidores más jóvenes, comparado con tres veces más bajo ACA. El proyecto de ley del Senado es sustancialmente similar al aprobado por la Cámara el mes pasado, pero difiere en algunos aspectos clave. La medida del Senado propone un calendario más lento para la eliminación gradual de la expansión del Medicaid, y elimina por completo el requisito de que las personas estén aseguradas en vez de simplemente cobrarle más a los consumidores que estuvieron un tiempo sin cobertura, como lo hace el proyecto de ley de la Cámara. También reduciría el gasto federal en el Medicaid a largo plazo, de manera más profunda que el proyecto de ley de la Cámara. Los dos proyectos también manejan subsidios a las primas de manera diferente: la versión de la Cámara los basaría solamente en la edad, mientras que la propuesta del Senado inlcuiría factores como edad, ingreso y lugar de residencia. Cerca de un tercio de los residentes de California -13,5 millones de personas- están bajo el Medicaid, conocido como Medi-Cal en el estado. Cerca de 3,8 millones de ellos han ganado cobertura desde que ACA, también conocida como Obamacare, entrara en vigencia en 2014. Otros 1,3 millones tienen cobertura de salud a través de Covered California, el mercado de seguros estatal. Bajo el proyecto de ley del Senado, las compañías de seguros tendrían que aceptar a todas las personas independientemente de sus condiciones preexistentes. Sin embargo, la medida permitiría a los estados eliminar los “beneficios esenciales de salud” que se requieren bajo el Obamacare, tales como visitas al hospital y beneficios de salud mental. Algunos expertos en salud creen que las aseguradoras podrían usar eso como una excusa para excluir a las personas con historial de enfermedad, simplemente vendiendo pólizas que no incluyan la cobertura que necesitan. Eso preocupa a personas como Cory Dobbs, cajero en un supermercado Grocery Outlet, quien tiene VIH y cáncer. Los críticos de la Ley del Cuidado de Salud Asequible argumentan que el gobierno federal necesita controlar los costos y que los estados deben asumir más responsabilidad para proveer atención de salud. Por ejemplo, los estados podrían derivar el presupuesto destinado a otras áreas si quieren continuar con la expansión del Medicaid, dijo Lanhee Chen, experto en políticas de salud en Hoover Institution. “Tiendo a tener una respuesta negativa a la idea de que la alternativa del Obamacare dará lugar a que la gente pierda cobertura”, dijo Chen sobre el empuje republicano para derogar la ley. “Esto no es sólo una cuestión de lo que hace el gobierno federal con el financiamiento del Medicaid, sino lo que el estado puede hacer si los cambios de financiamiento se convierten en ley”. 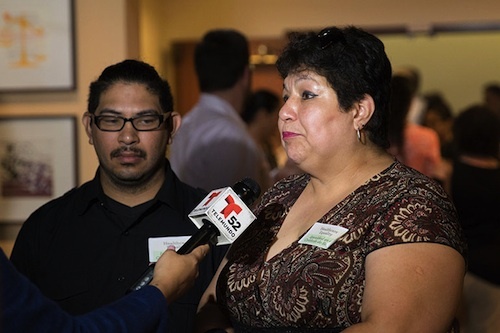 Sin embargo, Sarah de Guia, directora ejecutiva del grupo de defensa California Pan-Ethnic Health Network, dijo que el estado Dorado ha establecido un estándar alto en términos de cobertura bajo ACA, y que los esfuerzos de los republicanos amenazan esa cobertura. “California es obviamente líder”, dijo. “Pero con los cortes potenciales… es inevitable que el estado tenga que tomar algunas decisiones realmente difíciles”. En el programa Medi-Cal, eso podría significar ofrecer menos beneficios, disminuir la elegibilidad o reducir los reembolsos para los proveedores, que ya están entre los más bajos de la nación. Eso ha causado ansiedad entre el personal de clínicas comunitarias, hospitales de seguridad social y hogares de ancianos. “Las clínicas comunitarias continuarán y tratarán de mantenerse abiertas, pero es como sacar la alfombra que tenemos debajo”, dijo Deena Lahn, vicepresidente de política y defensa del San Francisco Community Clinic Consortium. “Ahora, Medicaid es la base financiera de nuestro trabajo”. El doctor Jay Lee, médico jefe de la Venice Family Clinic con sede en Los Angeles, estuvo el jueves en una marcha de “guardapolvos blancos”, en Washington, DC, en oposición a los esfuerzos de los republicanos por “derogar y reemplazar” el Obamacare. El proyecto de ley del Senado “básicamente agita al Medicaid” y hace que sea más difícil para los médicos hacer su trabajo, dijo Lee. “Yo también podría escribir mis papeles [de recetas] en tinta invisible si los pacientes no pueden pagar por los medicamentos”. En el mercado de seguros individual, decenas de miles de personas que reciben subsidios federales ya no calificarían para ayuda debido a una disposición en el proyecto de ley del Senado que reduce los umbrales de ingreso para ser elegible. Funcionarios de Covered California, el mercado estatal, dijeron que el proyecto de ley podría tener un amplio impacto en los beneficiarios. “A primera vista, no sólo proporcionaría una cobertura de salud mucho más escasa que la que se ofrece hoy, sino que millones de personas no tendrían cobertura alguna”, dijo Peter V. Lee, director ejecutivo de Covered California, en una declaración escrita. Algunos consumidores apoyan un rechazo de ACA. Sarah Foster, de 83 años, se opone a las propuestas de salud del Senado y de la Cámara de Representantes, pero por una razón diferente: no piensa que vayan tan lejos como para revocar totalmente el Obamacare. Foster, residente de Sacramento que está en Medicare y Medi-Cal, dijo que nunca tuvo problemas para encontrar un médico antes de ACA. La mujer dijo que, después que la ley se aprobó, pareció que muchos médicos entraron en atención especializada debido a la “burocracia” asociada con la ley. Ahora, dijo, no tiene médico de atención primaria. “Así que estoy corriendo por ahí tratando de encontrar una persona [de medicina] interna”. Los hospitales de redes de seguridad, que también se han beneficiado de ACA, temen el impacto de una revisión republicana. Los hospitales públicos de California podrían perder apoyo por más de $2 mil millones al año si se deroga la expansión del Medicaid, según la California Association of Public Hospitals and Health Systems. El proyecto de ley es un “esfuerzo inútil para ahorrar dinero”, dijo Erica Murray, presidenta y CEO del grupo, en un comunicado. “Simplemente negarse a gastar dinero en atención médica no reduce el costo de la atención, ni la necesidad”. El doctor Matthew Hickey, de 30 años, residente médico de la Universidad de California en San Francisco, que trabaja en el Hospital General de San Francisco, el hospital de la red de seguridad de la ciudad, dijo que le preocupa que la ley “reduzca drásticamente tanto la cobertura como la calidad de la cobertura”. Agregó: “En particular los recortes al Medicaid son bastante preocupantes. Muchos de los pacientes que atiendo y que recibieron cobertura a través de la expansión del Medicaid no podrán verme”. La población con seguro de salud en California ha crecido enormemente en los últimos años con Medi-Cal, el seguro médico subsidiado por el estado, aunque el futuro de su financiación no está claro, indica un estudio presentado hoy. El análisis, “Financiando el programa Medi-Cal”, elaborado por el Instituto de Política Pública de California (PPIC), señala que cada vez California debe disponer de más fondos para mantenerlo al nivel actual, que representa el segundo gasto después de la educación en el presupuesto general. “Mientras el Gobierno federal ha financiado una gran parte del crecimiento del programa, los costos estatales también han aumentado”, señaló Shannon McConville, autora del informe junto con Paul Warren y Caroline Danielson. “Este aumento de costos combinado con una política mayor de cambios todavía concebibles a nivel federal, ha creado incertidumbre adicional acerca del futuro de la financiación de medical Medi-Cal”, anotó la analista de PPIC. Según señala el estudio, actualmente Medi-Cal representa el 15% del total general de gastos del presupuesto del estado, el segundo mayor después de la educación de kínder a preparatoria. El análisis destacó también que en la última década el costo del programa, conocido en el resto del país como Medicare, aumentó de 40.000 millones de dólares en el período 2005-2006 a cerca de $100.000 millones en el 2016-2017. En ese mismo período, la participación en la financiación por parte de California ha disminuido de cerca del 40% hasta aproximadamente el 20% y “adicionalmente, la financiación de otras fuentes incluyendo gobiernos locales y proveedores ha aumentado”. Igualmente el estudio señaló que el Gobierno federal en los años 2014 a 2016 de implementación de la Ley de Salud Asequible (ACA), pagó el 100% de los costos de la cobertura de Medi-Cal para el nuevo grupo elegible, básicamente adultos de bajos ingresos sin niños dependientes. Sin embargo, bajo los términos de la ley actual, esa aportación federal disminuirá gradualmente para llegar a 90% en 2020. Otra ayuda federal establecida por ACA representó entre el 2010 y 2015 más de $10.000 millones en pagos a hospitales que atienden un alto número de usuarios de Medi-Cal y pacientes sin seguro médico. No obstante, de continuar esa ayuda, se reducirá a cerca de $6.000 millones para el 2020, en algunos casos con la obligación de una participación igual por parte de los gobiernos locales o los proveedores de los servicios de salud. El análisis calcula que actualmente los gobiernos locales pagan cerca de $5.000 millones cada año, equivalentes a un 20% de los fondos de Medi-Cal, a través principalmente de pagos de los sistemas hospitalarios, que provienen mayoritariamente de otros fondos del gobierno como las universidades públicas. Con la “volatilidad de los ingresos previstos” en el presupuesto general de California, el tema de Medi-Cal se torna un punto de importante discusión en la próxima aprobación del Plan de Gastos. El estudio recomienda que se busquen fuentes de financiación para Medi-Cal “que puedan ser ofrecidas consistentemente a largo plazo” y que también sean “económicamente eficientes y simples”, entre otras características.